= this section is dedicated to the development of Commonfare, "a participatory form of welfare provision based on collaboration among people". Check out the key concept of Generative Justice: An Introduction to Generative Justice. By Ron Eglash. Revista Teknokultura, Vol. 13(2), 369-404. Key document from the P2P Foundation: Value in the Commons Economy, our report on the transition in value regime, by Michel Bauwens and Vasilis Niaros. 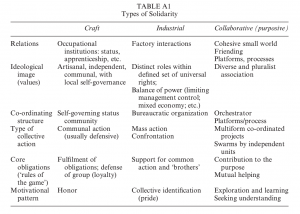 Solidarities and Collective Action in Post-Industrial Societies  : this article describes the evolution of forms of solidarity from craft-based associations to industrial unions, idendity movements and today's networked and swarm-based protocollary organizations. "The present financial base of social insurance — payroll contributions by workers and employers — has essentially maxed out. Nor is it possible to supplement existing labor income by taxing it. So a 21st century system of economic security will have to be built on a new financing model, which I have proposed to be income from common wealth, in the manner of Thomas Paine and the Alaska Permanent Fund (see With Liberty and Dividends For All). Picture, then, a giant “common pot” into which flows money from multiple forms of common wealth and out of which flow monthly dividends to every American with a Social Security account. Such a pot could begin, as Social Security did, with a relatively small inflow and outflow, and grow over time as Americans become comfortable with it. Its funding sources could include fees on pollution of shared ecosystems and use of socially constructed financial infrastructure, as well as new money created in the manner Mellor proposes. The P2P Foundation supports the emergence of Commonfare practices of social solidarity for networked workers who co-created commons and shared resources (see our special section http://p2pfoundation.net/Category:P2P_Solidarity), as well as their integration with a strengthened welfare system. In particular we support the creation of 'labor mutuals', i.e. freelance coops which already exist in the French-speaking world (Coopaname in France ; SMart in Belgium, Bigre, etc ..; see the project of AltGen in the UK). Read up here at Business and Employment Cooperatives, they are a "legal form (in Belgium, France ?) that allows self-employed to be salaried by their own joint cooperative, thereby obtaining the social protections of the salaried workers". Mutual Aid Beyond Communism. Jeff Shantz. Hauke Brunkhorst, Solidarity: From Civic Friendship to a Global Legal Community, trans. Jeffrey Flynn (Cambridge, Mass: The MIT Press, 2005): " a comprehensive intellectual history of solidarity from Aristotle to the present, with a chapter devoted the related concept of fraternité in post-revolutionary French thought"
Esping-Andersen, G. 1990. The Three Worlds of Welfare Capitalism. Princeton, NJ: Princeton University Press. Marie-Claude Blais, La solidarité: Histoire d’une idée (Paris: Gallimard, 2007). * Eric Hopkins' Working-class Self-Help in nineteenth century England. Pat Conaty: "We need to be aware that public services as we know them had their origins in pioneering class struggles by commoners that developed the fundamental social economic innovations." Pages in category "P2P Solidarity"
This page was last modified on 7 September 2018, at 06:43.